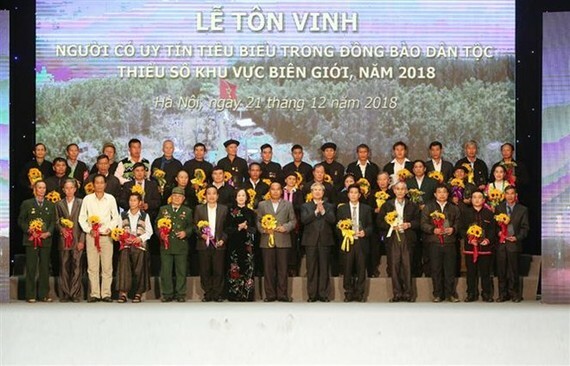 A ceremony honouring outstanding figures of border ethnic minority communities took place in Hanoi on the evening of December 21, as part of activities to mark the 74th founding anniversary of the Vietnam People’s Army (December 22). The event, co-organised by the Communist Review, the Government Committee for Ethnic Affairs and the Border Guard High Command, gathered 163 delegates of 45 ethnic minority groups, who are village patriarchs, village heads and other prestigious figures hailing from across 34 border cities and provinces. The oldest of them is 82 years old and the youngest is 28. 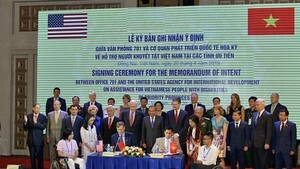 Speaking at the ceremony, Politburo member and standing member of the Party Central Committee’s Secretariat Tran Quoc Vuong described the delegates as the important links connecting the Party and villagers. They are the pillars of the community where they live, he said. Pointing to latent complicated problems in sea and border security, including unplanned internal migration and activities of hostile forces, the Party official urged ministries, sectors, and armed forces to strengthen their ties with the prestigious people in ethnic communities. He asked the delegates to continue encouraging villagers to engage in protecting the border security, building new-style rural areas, and getting rid of outdated customs. Earlier the same day, Party General Secretary and President Nguyen Phu Trong had a meeting with the ethnic minority delegates. According to Minister-Chairman of the Government Committee of Ethnic Affairs Do Van Chien, Vietnam has 1,019 border communes in 235 districts of 44 provinces neighbouring Laos, China, and Cambodia.